The Kiruna UV Combi truck is used with two or more containers for non-stop haulage. 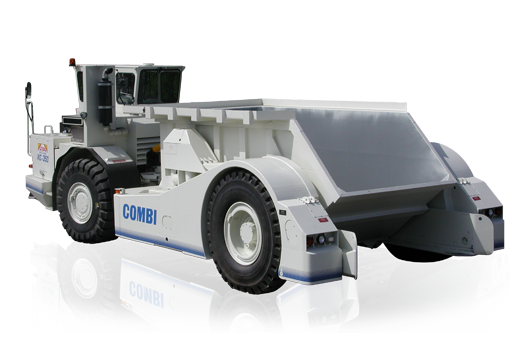 While the empty container is being filled by the loader, the Combi takes the full container to the dumping site. Both loader and truck are utilized optimally. Switching containers takes less than a minute. The truck is able to transport a variety of materials on custom built load carries. Options provided on request. Customized containers and load carries. The Kiruna UV CT (Combi Trailer) is a load support based transporter with elevating loading platform. Articulation, a large stability triangle area and a stable rear car enable the CT to work with simple, cost-saving load supports. Typical application: piles of slabs – resting on two supports only – are picked up, transported and put down anywhere without need for pallets or cranes.